Zuora, the leading cloud-based subscription management platform provider, today announced that the company’s CEO and Founder Tien Tzuo released the definitive guide for how to succeed in the Subscription Economy, “SUBSCRIBED: Why the Subscription Model Will be Your Company’s Future – and What to Do About It” at Zuora’s annual conference Subscribed™ in San Francisco. More than 10,000 people attend the Subscribed series of events each year to learn how to succeed amidst the most disruptive business model shift in a century. 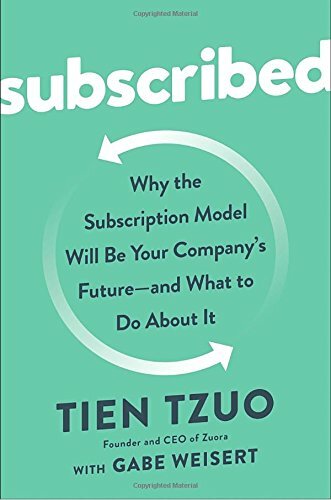 On June 5th, not only will attendees hear from Tzuo, the foremost expert on the Subscription Economy®, the entire world will have access to his playbook. According to SUBSCRIBED, we’re at a pivotal moment in business history, one not seen since the Industrial Revolution. The world is moving away from products and toward services. From Netflix and Salesforce, to Spotify and Amazon, subscriptions are exploding because billions of digital consumers increasingly favor access over ownership. Yet most companies are still built to sell products. They’re not prepared for the next hundred years of business and this means huge opportunities are up for grabs. According to the Subscription Economy Index™ (SEI), Zuora’s proprietary index that tracks the growth of the Subscription Economy, subscription revenue growth rates have continued to accelerate every year since 2012. “Industry after industry, businesses understand that subscriptions are the future of revenue growth. But they’ve been clamoring for a how-to succeed guide. That’s why I wrote SUBSCRIBED - a blueprint to win in the Subscription Economy,” said Zuora CEO and Founder Tien Tzuo. According to SUBSCRIBED, inventing and launching a subscription business is the easy part. Wrapping the entire business operations around the customer is the challenge. The changes required are transformational and SUBSCRIBED is focused on providing a practical guide for any business seeking to succeed in the Subscription Economy. Aaron Levie, CEO and Founder of Box said, "This book is ostensibly about subscription models, but it's ultimately about the future of business. In SUBSCRIBED, you'll learn from the masters of this business model and fundamentally change the way you think about your product, customers, growth, and talent -- no matter what industry you're in." Adobe who has transitioned from selling enterprise software licenses to offering cloud-based solutions for a flat monthly fee, quadrupling its valuation. Fender who evolved from selling guitars one at a time to creating lifelong musicians by teaching beginners to play and keeping them inspired for life. Caterpillar who uses subscriptions to help solve problems -- it’s not about how many tractors you can rent, but how much dirt you need to move. According to SUBSCRIBED, shifting the mindset from product-centered business to consumer-centered business will allow businesses to move beyond the linear. Organizations can be fluid and cohesive, recurring and responsive, informed and inspired, and this book will help guide companies on how to prepare and achieve maximum results, rather than trying to catch up later. This is "the subscription factory". Today's consumers prefer the advantages of access over the hassles of maintenance, from transportation (Uber, Surf Air), to clothing (Stitch Fix, Eleven James), to razor blades and makeup (Dollar Shave Club, Birchbox). Companies are similarly demanding easier, long-term solutions, trading their server rooms for cloud storage solutions like Box. Simply put, the world is shifting from products to services. But how do you turn customers into subscribers? As the CEO of the world's largest subscription management platform, Tien Tzuo has helped hundreds of companies transition from relying on individual sales to building customer-centric, recurring-revenue businesses. His core message in Subscribed is simple: Ready or not, excited or terrified, you need to adapt to the Subscription Economy -- or risk being left behind. * Adobe transitions from selling enterprise software licenses to offering cloud-based solutions for a flat monthly fee, and quadruples its valuation. * Fender evolves from selling guitars one at a time to creating lifelong musicians by teaching beginners to play, and keeping them inspired for life. * Caterpillar uses subscriptions to help solve problems -- it's not about how many tractors you can rent, but how much dirt you need to move. In Subscribed, you'll learn how these companies made the shift, and how you can transform your own product into a valuable service with a practical, step-by-step framework. Find out how how you can prepare and prosper now, rather than trying to catch up later.